We never think of our own bodies as toxic, but for some people they can be, and this sad fact of reality often only dawns slowly. This type of illness can be understood in terms of a recognition problem between proteins. Problems of the body finding itself toxic are also observed in lipid-containing systems. Our understanding of a genetic condition called Tay-Sachs disease (TSD) is based upon evidence relating to a failure to break down certain lipids called gangliosides. A build-up of gangliosides causes the symptoms of the disease, which becomes evident in the first few months of life (Stryer, 2000). As this condition is genetically determined, without a change to the genetic structure of the individuals concerned, only a treatment of the symptoms is feasible. Figure 1. The inheritance of dominant (top) and recessive (bottom) genetic conditions. If a trait is mediated by a dominant gene (D), statistically half the offspring will develop that trait. If it is mediated by a recessive gene (d), both parents must carry the gene in order for only one in four to develop it, however two in four offspring will carry it. The genes that cause TSD are recessive, meaning that the condition is only observed in an individual if both parents carry the recessive gene (Figure 1), such that a recessive copy from both parents is inherited. The chances of acquiring a recessive genetic condition are therefore one in four under these circumstances. Additionally, if both parents carry the recessive gene in their genotype, two in four (one in two) of the offspring will also carry the gene (but not suffer the disease). If only one of the parents carries one recessive copy, statistically none of the off-spring will develop the condition*. . The only way a child could develop the condition under those circumstances was if a serious mutation occurred, leading to two copies of the recessive gene being present. TSD is also known as GM2 gangliosidosis. This is because the condition centres around the breakdown of ganglioside GM2, a lipid found in nerve cells (neurones, Figure 2). 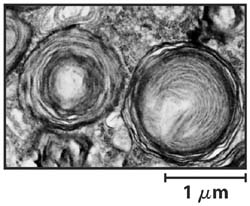 In TSD, the ganglioside is not broken down and so it builds up in lipid-storage organelles in cells, called lyposomes (Figure 3). The failure of the ganglioside to be broken down, is caused by the absence of an enzyme called β-N-acetyl hexosaminidase. The build-up of ganglioside GM2 that then occurs causes cells to die (Stryer 2000). GM2 gangliosides are particularly common in the nerves of the brain and spinal cord and so when those cells die, the symptoms of the disease are observed through changes in the behaviour of those systems. The absence of the required enzyme is a result of mutations or errors in something called the HEXA gene (NCBI website, 2012). This means that the enzyme is not synthesised in the same way as it is in unaffected individuals during protein synthesis. This is because amino acids in the primary sequence are missed out (causing a frame shift), or are replaced with others. This means that this globular protein does not fold up properly and so the active site in the normal β N acetyl hexosaminidase does not form, causing the catalytic activity of the protein to be either drastically reduced or entirely absent. Figure 3. An electron micrograph of spinal cells from a sufferer of Tay-Sachs disease, Nelson & Cox, Lehninger Principles of Biochemistry. This picture shows the enlargement of lyposomes (by a factor of 100) on accumulating gangliosides. The clinical symptoms of TSD include muscle weakness and poor muscle co-ordination (ataxia). The combination of these means that normal movements, such as crawling and turning over, stop before the child is a year old. The patient quite literally is unable to move him or herself; the nerves connecting the brain to the muscles just do not work. After this time, nerve function is reduced still further, causing sufferers to go blind and deaf. There is also a characteristic formation of spots on the eyes that are cherry-red, which is a symptom unique to this condition and is taken as a strong diagnostic sign. Paralysis is also common in the latter stages of the disease, before death. Death normally occurs before the age of 3 years (Desnick and Kaback, 2001). The condition is thus very serious and the opportunity for care is basically absent. There is a form of TSD that appears more slowly, though this is rarer than the usual form. This is known as late-onset Tay-Sachs disease. The same symptoms are evident, by their progress is a good deal slower than in the more common (infantile) form. The cause in this case is too little of the enzyme to break down the ganglioside effectively. This arises because of a fault with the gene that regulates the synthesis of β-N-acetyl hexosaminidase from the HEXA gene. 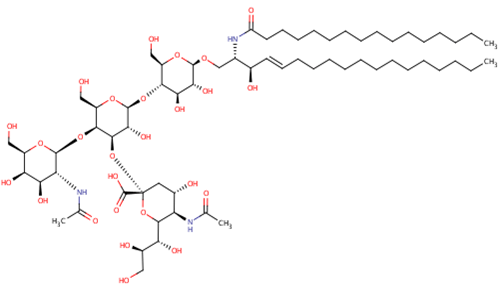 Another possibility is that the enzyme that is produced is only slightly mutated and so it does have some catalytic activity but that this is much less than the healthy form. It is now possible to diagnose the condition during pregnancy, where a sample is taken and tested for activity of the enzyme. If there is little or no activity, it is asserted that the enzyme is absent and that the child has the condition. Statistics from America suggest that, in that country, about 3% of Jews originally from eastern Europe (Ashkenazi) carry the disease, with only 0•03% of the general population being carriers (Stryer 2000). There are also ‘pockets’ of the condition elsewhere in North America, with evidence for it in communities in Pennsylvania, Louisiana and Quebec (Desnick and Kaback, 2001). As the number of carriers of the condition is relatively low, and so closer-genetic breeding (such as first- and second-cousins) is required for the chances of two carriers to be statistically likely, the impact of this condition is low. However, the effect of the principle form of the disease (infantile-onset) on the individual is clearly severe, and thus heartbreaking for the family. The occurrence of the condition in a child will raise the question of which other children of those parents may be affected, and how further pregnancies should be managed. Religious belief may also influence this. In Jewish religious law, there is not a clear policy on abortion and so parents of Ashkenazi Jewish extraction may be able to abort pregnancies in which the foetus has Tay-Sachs disease. However, prospective parents in places such as Pennsylvania and Louisiana may not be able to do so, as much of the United States of America is decidedly anti-abortion. Thus in the few cases where babies are born with this condition, questions about the compassion amongst an anti-abortion approach may be raised. Current medical thinking suggests that the only feasible option for dealing with both of these conditions is through preventative medicine. This means that clinicians and physicians use strategies and methods to prevent the disease occurring or starting, rather than trying to change it (management) or undo it (cure) once it has started. Although this would clearly be effective, and prevent disease occurrence, unfortunately it raises a variety of ethical questions for religious people, particularly Christians, who find themselves unable to exert any personally-driven influence on the process. This is particularly relevant for TSD, which occurs in strongly protestant communities in parts of the USA (Louisiana, Pennsylvania). Such steps include screening pregnancies for the conditions. Another option is fertility treatment in which several ova and the resulting embryos are screened for the condition(s) and those found to have it are discarded, ensuring that the condition does not propagate to the offspring but that they are ‘their’ children. Aborting pregnancies in which the condition(s) have been detected is also an option, though the prospect of this is quite emotionally, as well as religiously, difficult. Despite this, the study of these conditions has produced a good deal of understanding of both the conditions themselves but also about genetic inheritance and the effect of neurological disorders, both short- and long-term, on the body. Without a concerted effort to avoid these conditions through preventative measures, the conditions will never disappear altogether. Additionally, further random mutations may occur, leading to a re-emergence of these diseases, or ones that closely resemble them. * This method of recessive inheritance is also how ordinary traits such as eye and hair colour are inherited. Tay-Sachs Disease, Ed. Robert Desnick, Michael Kaback, 978-0-12-017644-1, Academic Press, 2001.